The French, in general, are very adept to purchasing via the internet where they are looking for a wider product range to that found in the shops, plus value-for-money. 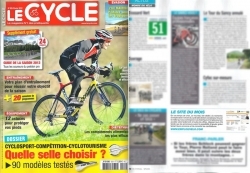 Cyclists are no exception, the specialist magazine Le Cycle (www.lecycle.com) recently (July 2013) undertook a survey of its readers asking the question, "Have you bought or are you thinking of buying (cycling) materials on the internet ? ", the result was an astounding 83% in favour of the web. 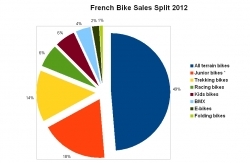 The French Bicycle Observatory registered 2.9 Mn bicycles sold in 2012 and total sales (including components and accessories that accounted for 466 Mn �) amounting to 1.28 Bn �, an identical figure to 2010. In 2011, total sales amounted to 1.35 Bn �. In the 1st half of 2013, sales of mobility bikes continued their strong progression, with e-bike sales improving by 17% cf. same period 2012 and folding bikes by 25%.